Monique Billings and Jordin Canada clapped out the UCLA fight song on Pac-12 media day while recording themselves. Photo courtesy of Pac-12 Networks. 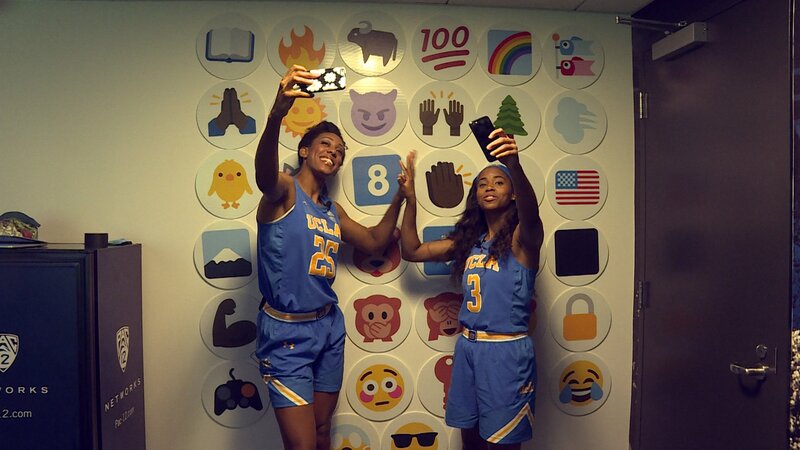 UCLA senior forward Monique Billings and senior guard Jordin Canada talked to WomensHoopsWorld’s Sue Favor about the upcoming season, their trip to Japan this past summer as part of USA Basketball’s Tournament-winning U23 team, and their changed perspectives on life and basketball. Sue Favor: I can’t believe you’re seniors. Did it come fast for you, or not? Monique Billings: It’s going at the right pace. Looking back at everything, it feels like it’s time to be a senior. Jordin Canada: It came fast for me. People tell you college goes by really fast and then it happens and you can’t believe it. But like Mo said, it’s time for us to be seniors. Sue Favor: What was your experience like in Japan? Monique Billings: I was proud of how I performed at the tryout, and I decided that whether I made it or not, I was proud of myself. I put so much pressure on myself prior to the tryouts, so I was like, forget the result. I went all out and did the best that I could. If they need me, cool, I’m here. If not, you know….but I’m glad they needed me. 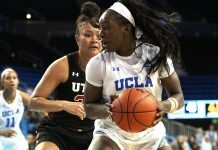 Jordin Canada: Going back (to USAB), I kind of knew what to expect and what the coaches and the committee wanted from certain guards and point guards, but it was still a lot of pressure because you’re going up against great girls who are extremely talented. So it’s still difficult, but when you kind of know what to expect and what to do, it’s a bit easier. When I made the team I was very proud of myself because it’s an honor to play for USA Basketball. Just that whole experience of being around a great group of girls you learn a lot, and you learn things you didn’t know about yourself. Overall it was a wonderful experience and a great honor. Sue Favor: What did you learn about yourself? 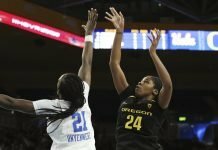 Jordin Canada: I have to be more versatile. I’m used to just playing the one and not being an off guard. Playing with those girls, everybody can handle the ball, everybody can bring it up. It’s being able to play different positions. Sue Favor: What was Japan like? Monique Billings: It was cool, but it wasn’t what I expected. A lot of people hyped it up, like it was a dream. But when I got there I felt like it was a different world. I’m used to Cali weather, but it was cool, the people were really nice, we have a lot of fans. Jordin Canada: It was a lot of fun, it was very different. The people were extremely nice. Everything is very compact, so that was very different I wasn’t expecting that. In some ways it was very Americanized. In some areas they had Outback Steakhouse and Friday’s. Where we stayed was very Americanized. It was a lot of fun, and the girls made it really fun to be in Japan. It was a great time. Sue Favor: If you could go back and talk to your younger self, what would you tell her? Monique Billings: To have perspective. I feel like that’s something I would have liked to have told my freshman self. It does get a little easier in certain respects, but you have to keep pushing forward. Jordin Canada: Be a leader now; don’t wait until it’s your turn, and don’t feel like you can’t because you’re a freshman or a sophomore. You’re willing to be a leader no matter what age you are; it’s just about your mindset. 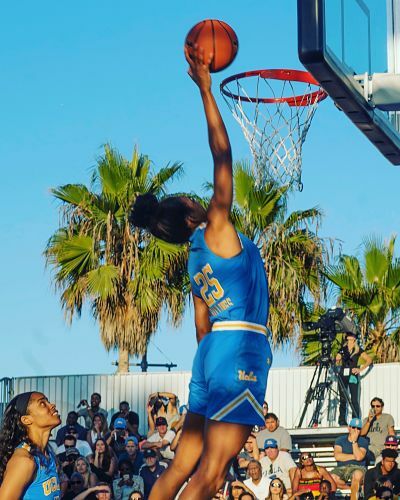 Monique Billings participates in a dunk contest with UCLA men’s players earlier this month, while Jordin Canada looks on. Photo by Ted Chalfen/UCLA Athletics. Sue Favor: What have you learned from each other? Jordin Canada: What I love about Mo is that she has that mindset of attacking every single time, and her athleticism is unbelievable. I don’t think I’ve ever played with someone who has so much athleticism. It’s like, flawless. When you see her run up and down the court, when she grabs rebounds, it’s unbelievable to watch. She has great willingness to learn and grow. I love the way she’s grown into who she is. She’s very confident, no matter what people think about her or what they might say, it doesn’t matter – she’s just going to continue to do her, and that’s what I love about her. Monique Billings: I’m going to talk about Jordin off the court. 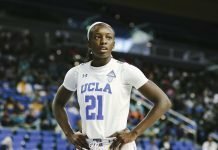 Before coming to UCLA, I didn’t know much about her. She’s quiet, and we had played against each other in sixth grade, maybe younger. I’d heard a lot of things because she was a big name around here. I thought she was cocky, but when I met Jordin I saw that she was really personable and nice. Jordin is goofy, on and off the court. She’s easy to relate to. She makes my job on the court easier because I know she has my back and I’m not out there alone, which is the greatest feeling in the world. She’s a good friend now, like a sister. I’m happy I’ve been able to play with her for the last almost four years, hopefully more. Sue Favor: Both of you will probably be taken early in next spring’s WNBA draft. Do you think about that? Jordin Canada: We’re taking it one day at a time; we don’t want to get too far ahead thinking about that. We don’t want to lose focus. It’s kind of scary to know it’s only a few months away, but you don’t want to think about that because you want to be present and be on the team you’re with now. We need to make sure we get our goals accomplished. Sue Favor: What will you both be doing when hoops is over someday? Monique Billings: I want to be a sports broadcaster and a TV personality, as well as modeling, something with fashion, and traveling. Jordin Canada: I want to go back to nursing school to be an OBGYN. Or something in the music industry – not necessarily me singing, but being in that industry. Or both. Sue Favor: What do you each like to do for fun? Monique Billings: I’m all about relaxing and getting my body right. I like to get massages, get my nails done, get my hair done. I’m all about self-care. The older I’ve gotten, I just like to chill. Jordin Canada: The older you get, you realize…..I can’t believe when I was a freshman I wanted to do all this stuff. And now I just want to relax, because I’m doing so much. When you get older you realize that it’s time to relax and to chill. I like to do that. I like to spend time with my family. Sue Favor: You guys know you’re not old, right? Sue Favor: What is a fun fact about you that people might not know? What kind of music do you listen to? Jordin Canada: This might be very weird, but I really like driving and sitting in traffic, listening to music. Because I have a stereo in my car, and I love my stereo. I can sit in my car and listen to it forever. I have no problem being stuck in traffic, and most people – if not everyone – hates that. I love driving and sitting in traffic, that’s weird. It depends on the day and the mood I’m in. Sometimes I listen to R&B, sometimes I listen to rap. Mostly I’m an R&B type of person. Monique Billings: I enjoy working out with my dad; he’s a trainer, and I’ve been working out with him since I was in the eighth grade. That’s something I really like to do, and I think I’ll keep working with him for a very long time. I’m into neo-soul, I like R&B too, and before games I like listening to jazz. See also: Exponential growth prepares Bruins Canada, Billings for senior year.